In the mornings we like to open the two front doors and let in the ocean breeze while our kids play in the front yard. The porch is the perfect shady spot for morning coffee or a glass of wine in the evening. Hydrangea bloom along the front of the house and the sound of the ocean can be heard inside and out. A stay at 6 1/2 Heck feels like stepping back into Ocean Grove's early days when families would retreat to the shore away from busy lives. The home's interior is bright and calm. The first floor has a dining room with antique furniture and a large dining table that seats six or extends to seat eight. The completely renovated kitchen has solid wood cabinets, butcher block counters, an antique farm sink, and open shelving featuring reclaimed wood and subway tile. The clean white refrigerator, gas stove, microwave and dishwasher are brand new. The kitchen retains its lovely vintage built-in pantry. Washer and dryer are off the kitchen and there is a half bath on the first floor. Built in shelves hold rainy-day games and collection of art books. The sitting room and living room adjoin and feel like one large open room. The living room boasts views of the water from its large windows and its door opens out onto the porch. There is wireless internet and a television with cable in the sitting room. The living room is a favorite spot for reading, writing postcards and gazing out at the water after a long day at the beach. Upstairs are the four bedrooms, all furnished with the home's original antique furniture. Each room has its own large closet, dresser and new air conditioner. Three bedrooms have full beds and one has two twin beds. The master bedroom has ocean views from the bed and another has views from its two large windows. The full bath is located on this floor. New fluffy bath towels, quality linens and down pillows are provided for each room. (Please bring your own beach towels). We provide four beach badges, beach toys and chairs for use during your stay. Bikes can also be rented from the Ocean Grove Hardware Store on Main Avenue or Brielle Cyclery on the nearby Asbury Park Boardwalk. 1. No smoking, no barbecue permitted in the house or premises at any time. 2. 6 ½ Heck Avenue is an historic property and is nearly 150 years old. Please take care of our home as you would your own. 3. Use of the house and property is limited to eight people. We do not allow additional guests and a maximum of eight people are allowed on the premises, (house and porch) at any time. 4. We do not allow parties, receptions, weddings, rehearsal dinners, etc to be hosted on the premises. 6. This house is not suitable for loud hangouts. 7. 3 PM Check In, 10 am Check Out. The owners of 6 1/2 Heck Avenue are Jeanne Rondeau and Chris Beach. Alfredo Fresnedo of Re-Maxx manages the property for us. We live in Brooklyn with our three girls. We fell in love with Ocean Grove while visiting its Giant Flea Market. Ocean Grove cast its spell on us during our first visit. On a whim we decided to look at homes for sale. We visited several properties but knew immediately that 6 ½ Heck was a special place like no other in Ocean Grove. Entering through the magnificent front door felt like we were stepping back in time and experiencing the history of Ocean Grove. The proximity to the ocean, summer cottage feel and quirky rooms enchanted us. There is nothing better than walking out to the ocean first thing in the morning, or last thing at night. Our family has thoroughly enjoyed discovering Ocean Grove and the surrounding area and we know you will as well. In the short time we’ve owned this home so many wonderful memories have been created. We are so happy to share our home with visitors and we hope 6 1/2 Heck will be a place for memories of your own. We love the home's simple beauty and original details. In the mornings we like to open the two front doors and let in the ocean breeze while our kids play in the front yard. The porch is the perfect shady spot for morning coffee or a glass of wine in the evening. Hydrangea bloom along the front of the house and the sound of the ocean can be heard inside and out. A stay at 6 1/2 Heck feels like stepping back into Ocean Grove's early days when families would retreat to the shore away from busy lives. The full bath is located upstairs near bedrooms and the half bath is on the first floor. The home is equipped with a brand new on-demand hot water heater. There is an outdoor shower. Four houses from one of the world's most beautiful beaches. Ocean views from two bedrooms, living room and porch. Brand New AC Window Units in bedrooms and living rooms. Brand New Heating System and On-Demand Hot Water Heater. Quality linens and down pillows. Brand new stacking Electrolux washing machine. Brand new stacking Electrolux dryer. Living room adjoins TV sitting room and has ocean views. Brand New GE Artistry Series Dishwasher. Brand new white GE Artistry Series Refrigerator with automatic ice maker. Brand New white GE Artistry Series Gas Stove/Oven. Brand New white GE Artistry Series Microwave. New coffee maker and stovetop tea kettle. Dishes and silverware. Pots and pans, cooking utensils, serving dishes, bowls provided. Kitchen is brand new and has custom solid wood cabinets, butcher block counters, an antique farm sink, and open shelving featuring reclaimed wood and subway tile. All new appliances. Dining Room has antique furniture and a large heavy wood dining table which seats 6 and extends to seat 8. Large closet for serving pieces. Dining room adjoins kitchen and door opens on to porch. Collection of art books and some novels. Large supply of board games for adults and children. Board games and some beach toys provided. Front Porch with ocean views and furniture. Mini-golf is a short walk down the boardwalk in Bradley and Asbury Park. The boardwalk extends to Asbury Park and Bradley Beach and beyond. There are several restaurants, ice cream, playgrounds, mini golf, splash park, vintage pinball museum along the boardwalk. Fresh Direct as well as several restaurants will deliver to house. Live music in Asbury and concerts and performances at the Great Auditorium happen nightly during the summer months. 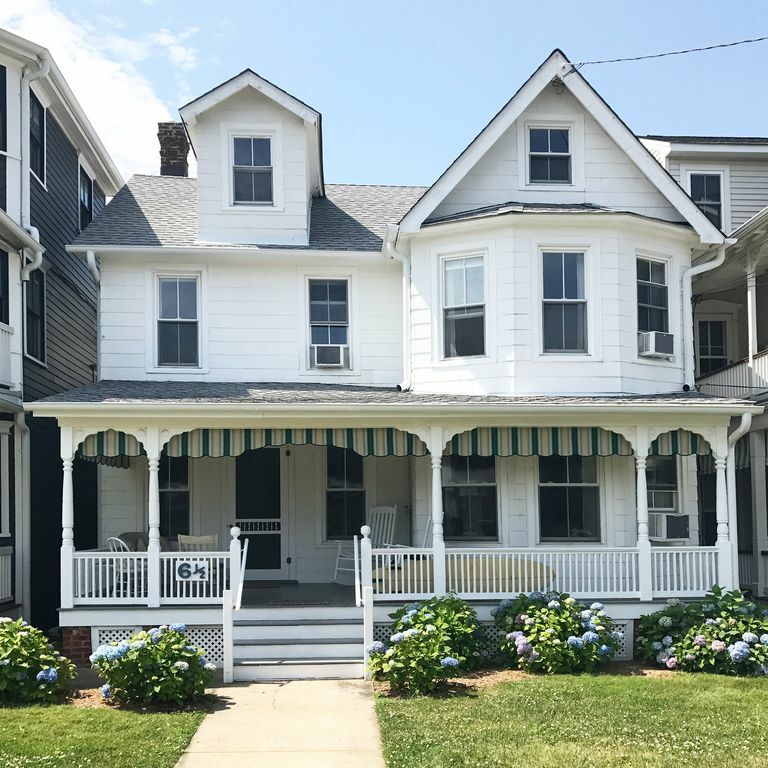 This charming Ocean Grove Victorian, a one-minute walk from the ocean, was a perfect setting for our Christmas family gathering. We loved being able to jump out of bed and race over to the beach to watch the magnificent sunrise each morning. We loved walking on the beach, so peaceful in the quiet season. We loved the fully-equipped kitchen to cook our breakfasts and dinners in. We loved the cozy comforters on the beds, even better than home! We wouldn't hesitate a second to book this wonderful home again. Thanks so much Terri. You are your family are welcome any time. A 15-minute stroll down the boardwalk, or through town and over one of the footbridges will bring you to newly revitalized Asbury Park. Asbury is so hip now! It offers great bars, restaurants, coffee shops, art galleries, music venues, shopping and independent theaters. There are also lots of activities for kids: swan boats in the lake, surfing lessons, an arcade and vintage pinball museum, miniature golf, Asbury Splash Park, and an amazing beach playground. Our kids love to watch the artists at Hot Sand glassblowing studio and eat at Tullulah’s whenever we are in town. We require all guest to review, complete and sign a lease agreement when they reserve our home. Please contact Alfredo at (732)-763-2961, alfresnedo@yahoo.com for reservations, off-season and longer term rentals.